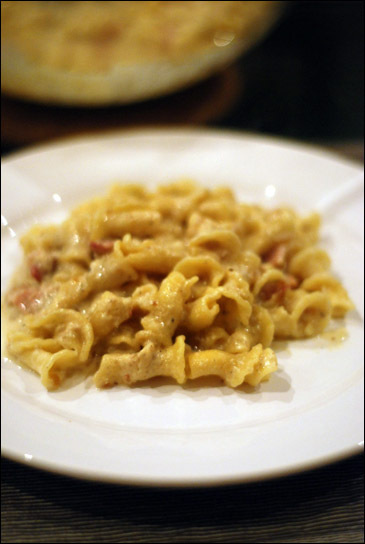 A quick and easy Monday night supper, this is a slightly lighter version of a classic favourite – I often find “real” carbonara too rich. I used fiorelli instead of spaghetti – I find it the perfect vehicle as you don’t end up with a bowlful of sauce and bacon bits at the end. If you can’t find fiorelli, linguini or penne also work well. First, make the base of the sauce – in a bowl or jug, mix together the eggs, sour cream, olive oil and skimmed milk, and whisk together with a fork. Then add the salt, pepper and pinch of nutmeg. Put the water on for the pasta. Next, fry the bacon in a little olive oil until crisp and then set aside. Remove any excess fat from the pan, add a tablespoon of olive oil and fry the shallots over a medium heat until soft and translucent, then add the garlic, cooking for a further couple of minutes. Now add the white wine and stock mixture and simmer down until most of the liquid has evaporated. Cook the pasta until slightly al-dente, drain and return to the pan, and then add all the other elements – garlic and onion, bacon, creamy sauce and parmesan to your pan. Cook over a low heat for a couple of minutes, taking care not to let your sauce boil, and serve. Very good receipes Grania. Don't think you got the tonno gnocchi receipe from me! I will try it out though! Well done - you've sorted your career out now. How pleased your father would've been!